Natural area managers use fire and grazing to achieve nature conservation⁄production goals and to prevent the loss of life and property. Yet, little is known of the effects of post-fire grazing on fuel load and the proportion of days on which fire can be sustained (fire potential). This knowledge could help managers in planning interventions to achieve their goals. 2. At seven sites in Tasmania, Australia, including sedgeland, heathy forest and grassland, fire potential and fuel load were measured before, and for 2 years after fire. Measurements were made in burning, fencing and burning plus fencing treatments, and in control quadrats. 3. Burning followed by grazing, largely by native vertebrates, resulted in lower fuel loads than either grazing by itself or burning by itself. A new steady state was established in two grasslands. Fire potential at the oligotrophic sites was largely a function of time elapsed since the last fire, while at grassy sites was increased by grazing without fire, but depressed or slightly increased by grazing after burning. 4. Synthesis and applications. 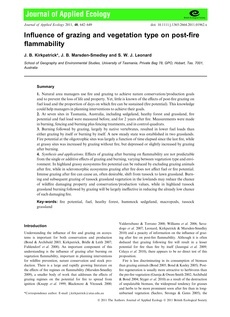 Effects of grazing after burning on flammability are not predictable fromthe single or additive effects of grazing and burning, varying between vegetation type and environment. In highland grassy ecosystems fire potential can be reduced by excluding grazing animals after fire, while in scleromorphic ecosystems grazing after fire does not affect fuel or fire potential. Intense grazing after fire can cause an, often desirable, shift from tussock to lawn grassland. Burning and subsequent grazing of tussock grassland vegetation in the lowlands may reduce the chance of wildfire damaging property and conservation⁄ production values, while in highland tussock grassland burning followed by grazing will be largely ineffective in reducing the already low chance of such damaging fire.